Wabi Sabi Bonsai offers an expansive collection of young and older established plants to make any space sing. Shop our online catalog or schedule an appointment to visit the nursery and pick some beauties out yourself. 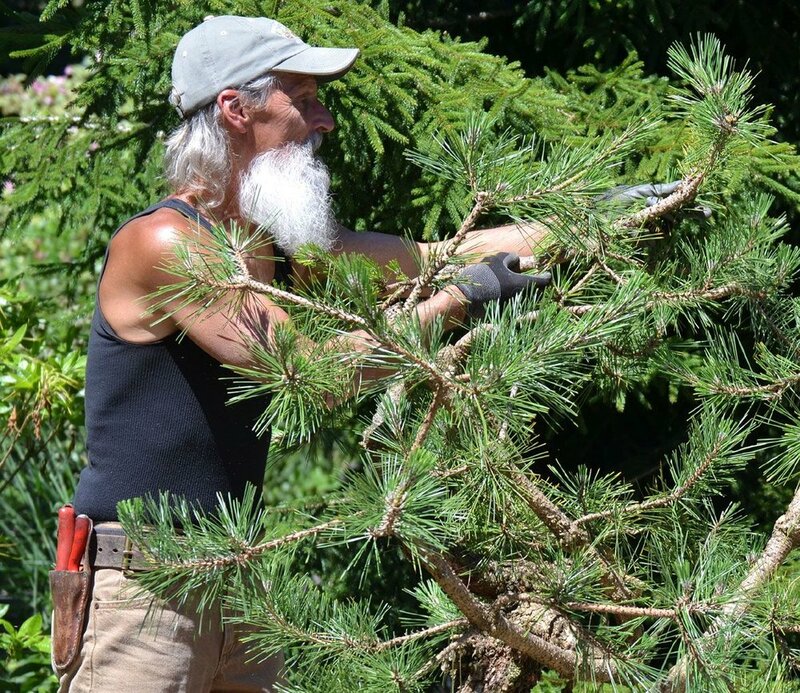 With decades of experience, I offer expert niwaki pruning services to transform your maples and conifers into working pieces of living art. I am in contact and work with NW professionals that offer services and recommendations for tree rejuvenation, health assessment as well as tree topping and limbing due to storm damage. If you are interested in having me tour your property, please contact me to schedule an appointment. I was born a Connecticut yankee in the late 40s and grew up appreciating the beauty and awe of the forests and coastline of New London County. Thanks to my naturalist, older brother's guidance and his being a real brother to me when I was a kid, I found myself emersed in becoming a fully fledged student of Nature for all she had to offer since I was probably ten. Coupled with early gifted and stimulating weekend art classes in clay sculpture for a few years I was already unknowingly moving toward 3-D nature art and yet didn't really even know a thing about it. In the 70s I lived in the great city of Boston for eight years while studying and practicing traditional Asian healing and the Order and Laws of the Universe. South Boston's Arnold Arboretum housed the Larz Anderson Bonsai Collection in Jamaica Plain which was my first ever encountered. I was overwhelmed at first by their presence but then after a few visits I became inspired when I was convinced that I had seemingly done this before in my distant past and that I could, would and should advance in this direction. Boston also produced my fortuitous encounter with a wonderful gal, Gretchen Naomi, who would become my beloved wife and then later my cherished partner in our very first public endeavor as Mt Si Bonsai in WA state. We moved to Seattle in '80 where she grew up and her parents still resided. Joining the Puget Sound Bonsai Association soon after provided our introduction to growing and training trees for bonsai in the Pacific NW climate. Receiving instruction and critiques from the 'Bonsai Bums' occasionally along with working our trees daily sharpened our eyes and skills. It wasn't until I hiked the SW face of Mt Si one summer day with a local plantsman up into the sun-baked exposed granite where the pine and junipers lived, that I was compelled to step up my aesthetic pace. What an opportunity it was to be able to study the structures firsthand and comprehend all the environmental effects present throughout the decades of their existence that could produce such stunning natural works of art ! I was never the same again. I went back to the nursery and got to work with Omi the very next day with a heightened awareness, a different perspective and an adventurous attitude. Our trees got way better as did my education up in that mountain classroom. I discovered they all have a chronological story to tell and if you have the experience and ability to decipher such development, their unfolding journey is always an enlightening adventure! Forever a student of nature, then bonsai and finally niwaki sculpture, I have forged a collective understanding and respect of tree aesthetics and culture from study and experience that has become both truly stimulating and deeply satisfying enough to last this lifetime and beyond.